Watching Japanese films (/series/anime/etc) is one of the most enjoyable ways to improve your practice dramatically. Only problem, of course, is that it requires a fairly high level already: unlike books, interrupting the movie to look-up each word in a dictionary is rarely an option and if there is too much new vocabulary, you soon lose the plot. In my experience, watching with non-Japanese subtitles on, makes for very poor practice: it’s too easy to fall back on the translation and much harder to pay attention to the Japanese at the same time. Using Japanese subtitles is a much better option (and great work-out for your reading skills), but still adds the difficulty of having to read kanji (and let’s face it: if you don’t understand a word, chances are you can’t read it either). And this is where KanjiBox comes in! Suppose you had a Custom Set tailored around the vocabulary in a given movie: spend some time drilling that study set until your stats bar is green enough and when you watch the movie, everything magically makes sense. Better studying, More fun! Here is how you can make such a set for your next Japanese movie-viewing. Depending on your luck and the material available, the steps involved can be more or less complex, but generally, it can be done by anybody in a couple minutes with a bit of motivation. When people create Study Sets, they can (and are encouraged to) make them ‘public’, that is: available to all users. Although as of today, KanjiBox’s database of public sets is pretty limited, hopefully more will appear over time. First log into KanjiBox and go to the Vocab page, then click on Sets and finally: Create or edit sets. Once the Sets editor appears, you can use the Search form to look for your movie by typing its name in English (or Japanese). If you are after just any movie study set, you could leave the search field empty, tick the film box and launch the search. 2012 Update: You can also use the new public interface here (points to the exact same collection, but offers a slightly more streamlined interface to browse sets). The movie you are looking for is there? Great! Simply click on Subscribe to add it to your list of sets, click on Resume Drill, make sure the set it selected and start drilling! In the Create form, pick a name for your new set (be sure to make it very descriptive, don’t be afraid to include both English and Japanese name), make sure the set is public access (consider making it also publicly editable, so that other users can help fix and improve it) and click on create. Immediately after creating the set, do not forget to add a description and check at least one tag box (maybe ‘film’ or ‘tv’): there too, do not be afraid to include as much detail (in as many languages) as you want: this makes it easy for other people to find your set later on. Of course, if you feel in good spirits, you could go through the movie yourself, listen and pick all the words one by one and add them: other users of KanjiBox will probably love you for that! You need to get your hands on a text version (.srt or .sub files) of the Japanese subtitles. Such subtitle files often accompany, ahem, “online” versions of movies. Some are also available in subtitle database websites (main ones are notoriously poor in Japanese subtitles but you can try smaller sites such as this one). As a last resort, it is not all that difficult to extract subtitles from the DVD: many tools exist that will do it in a nearly automated way, please google around for more info. Edit the set in KanjiBox and use the File Upload form to upload your subtitle file. If you have many files: no worry, simply upload them one by one. After each file upload, KanjiBox will parse the file content to extract all the words it knows (verbs and adjectives are automatically converted to their dictionary form). Have a quick look-over at the list of suggested additions and, if satisfied, click on the top-most checkbox to select them all. Click on Import entries, repeat for any additional files (of course, duplicate entries are detected and only added once). You’re done! If you are lucky enough to get your hands on a subtitle file for your film (or have the computer skills to rip it from your DVD), the whole process should have taken a grand total of 90 seconds. As you will notice, most subtitle files will result in large sets of vocabulary. 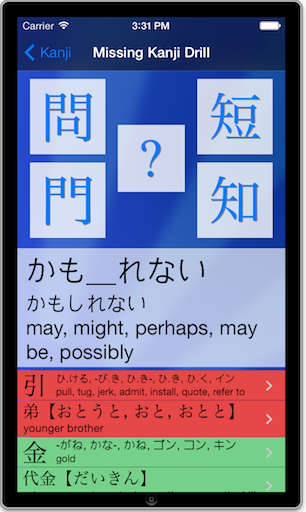 Indeed: even the most basic Japanese words get parsed and added (on purpose). This is absolutely not a problem. Thanks to the way KanjiBox uses your stats, all the words you’ve long mastered (and appear in green when you pull up the set’s stats) will rarely, if ever, come up in Drilling mode. In effect, KanjiBox will drill you precisely on the vocabulary words from the movie that you haven’t seen before (and automatically skip the basics if you know them). If looking for subtitles, or trying to create a specific set for something (movie, textbook or otherwise), the Online KanjiBox Forum has a special category to discuss Study Sets: don’t hesitate to go there and start a conversation! This entry was posted on Friday, November 4th, 2011 at 1:44 am	and is filed under Features, KanjiBox Online. You can follow any responses to this entry through the RSS 2.0 feed. You can skip to the end and leave a response. Pinging is currently not allowed.